After last weeks super successful savory biscotti, I had to try a sweet recipe. 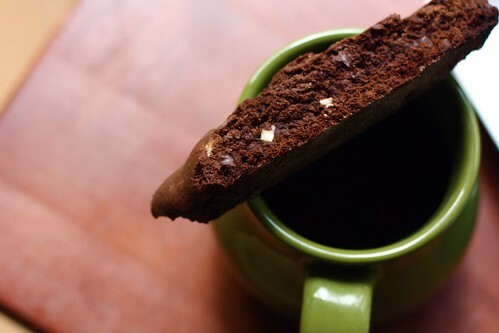 To me, this is coffee shop biscotti. 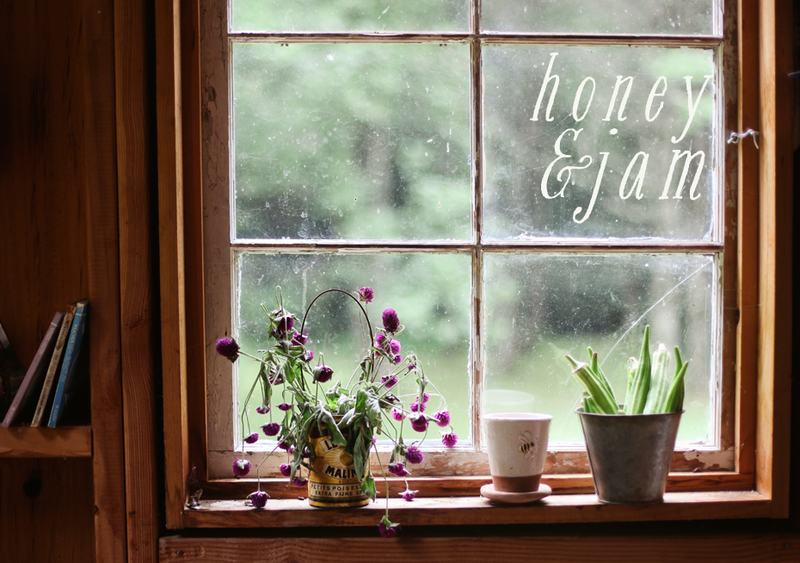 Perfect for a late afternoon staring out a window with a big cup of coffee or tea. I avoided making biscotti for so long, I have no idea why. I remember looking at some more complex recipes, ones where you had to bake it at a low temperature and then let it sit out over night. Both the recipes I’ve tried are nothing like that, and they come out perfectly. Crunchy and delicious. The almonds in the one really make it, in my opinion. It gives a nice contrast to the chocolate-chocolate. Just a tip: I’ve noticed with a lot of recipes that use cocoa powder, if you let them sit for a little while, and don’t eat them straight of the oven, they taste much better. The flavors seem to develop and they get a little sweeter. I tried these several hours out of the oven and they were so much better that the first time. Preheat oven to 350° F and butter and flour a large baking sheet. In a bowl whisk together flour, cocoa powder, baking soda, and salt. In another bowl with an electric mixer beat together butter and granulated sugar until light and fluffy. Add eggs and beat until combined well. Stir in flour mixture to form a stiff dough. Stir in the almonds and chocolate chips. 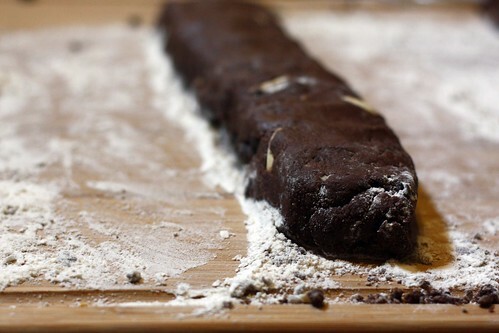 On prepared baking sheet with floured hands form dough into two slightly flattened logs, each 12 inches long and 2 inches wide. Bake logs 35 minutes, or until slightly firm to the touch. Cool biscotti on baking sheet 5 minutes. Hmm, I never really liked biscotti for some reason... don't know why though. It looks so good! 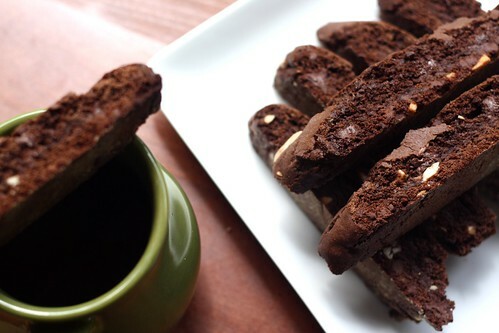 I certainly LOVE biscotti to death and therefore I may make this :) Thank you. YUM! i love biscotti. i'm going to have to give this one a try. OMG, this looks so darn good! With chocolate and nuts how can you go wrong? Those look abnormally perfect. Just have to decide which ones to try out first- the sweet or the savory. I love biscotti because it always looks so impressive, like you slaved all day on it, and yet it's so easy - just as easy as cookies! Love this version and will def try it soon. HANNAH!!! I WAS GOING TO PUBLISH YOUR COMMENT ON MY BLOG BUT I CLICKED THE REJECT BUTTON INSTEAD OF PUBLISH!!! I AM SO SAD AND I AM VERY SORRY!!! I DIDNT MEAN TO!!! Looks absolutely DELISH, Hannah!!! :) I will have to try this! I always was under the impression that biscotti was difficult to make, but you have inspired me! I've been reading your blog (all morning) for the first time. It's so lovely! 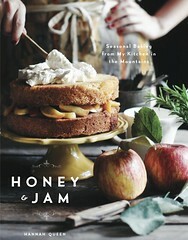 Your photography is stunning, your literary voice is tender and personal and your recipes are a sure fire. I'll be making cheddar zuch bread today. Thanks for the pleasurable read. Sometimes, biscotti scares me because I worry about my teeth. My mom spent a lot of money on these and hard food frightens me! However, these might be just the ticket to get over this fear! it's been too long since I've made biscotti. these are tempting. I love biscotti...at least the homemade, non-stale kind! What kind of chocolate did you use? 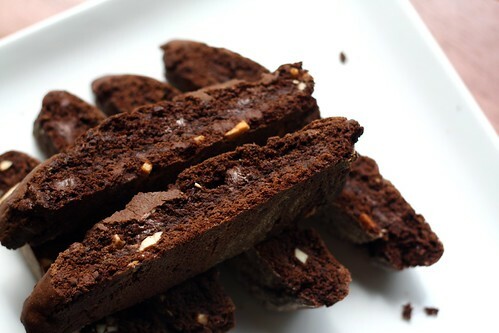 I've made these five or six times since seeing them on your blog, and they are by far the best biscotti I've had. Thanks so much for posting about them! With what would you replace the almonds (because of allergies to nuts) to keep a good balance? I just realized that I would comment here and let you know , a very interesting post visit here.